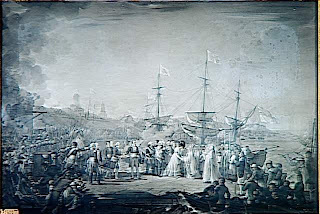 April 1814 was almost drawing to a close, when crowds of cheering people assembled in Calais to welcome the return of the Borboun family. It was with some trepidation that Marie Therese set foot on her native soil again. The warm reception both moved and disconcerted her. She was obviously happy to be home but she also couldn’t help thinking about the violence she had seen during the failed flight to Varennes. 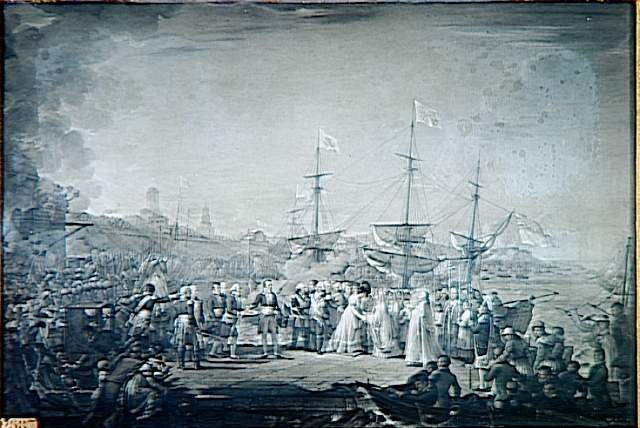 The family proceeded on their journey and, on the 28th, they arrived at Amiens. Here, the houses were belted in black cloth and their chimneys were black too. 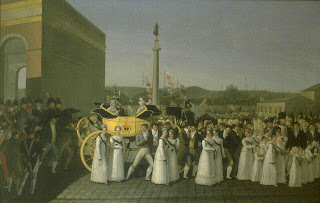 It was an unusual sight and when they enquired about the meaning of it, Marie Therese and Louis XVIII were told they were displays of mourning for Louis XVI. The townspeople had decorated their houses thus when he had been executed and, years later, they still remained untouched. On 3 May, the King and Marie-Therese, wearing a simple white gown embroidered with silver leaves and no jewellery, finally arrived in Paris, where they were welcomed by shouts of “Vive Le Roi!”. The Duchess managed to keep her composure until her arrival at Notre Dame Cathedral. Here, she collapsed on a prayer stool and cried. Then, she resumed her journey through Paris, her mind recalling all the horrors she had witnessed in that city during the Revolution. It was only natural, yet the Parisians were shocked the Princess didn’t look happy. Finally, the carriage reached the Tuileries. Overcome by her emotions, Marie Therese fainted. It was at the Tuileries that Louis XVIII established his court. The Tuileries, unlike Versailles, wasn’t associated with an exaggerated, lavish lifestyle. Besides, here, he could be closer to his people. Marie Therese could hardly be happy about living in a palace where her family had suffered so much during the Revolution. To feel joy here was a sacrilege for her. Thus, she only established a small household and dressed modestly, which caused the King to worry her behaviour may upset the people. The King, in fact, was keen to show that now the royal family had returned home, all the past sins and mistakes were forgotten. This wasn’t easy for Marie Therese to do. She found it hard to forgive her old friends who had thrived under Napoleon’s regime. But the person she despised the most, and absolutely refused to see, was her cousin Louis Philip, the Duc D’Orleans, whose father had been responsible for her parents’ death. Marie Therese realised that one of the mistakes her parents had made was to remain confined at Versailles. She thought it would be good for the monarchy if she were to travel throughout the country, and see and by seen by her people. So, in August she took what would be the first of many such tours visiting, among other towns, Riom, Clermont-Ferrand and Lyon. It was here among her people that she was the most comfortable and happier. She hated being in Paris, a city that held so many horrific memories for her, and where she had to deal with the new aristocracy who had risen during the Empire, and feign a happiness she didn’t feel. She preferred to spend her time with friends who had shared her misfortunes and had always remained loyal, visiting them privately. She also continued her charity work. The Duchess D’Angouleme believed her family was now firmly back on their throne, but she was wrong. On 26 February 1815 Napoleon escaped from the Elba island. Marie Therese was in Bordeaux, on one of her tours around the country, when she heard the news. 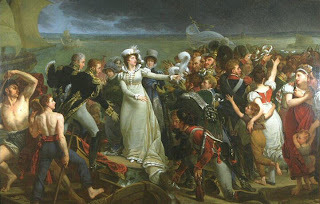 As her husband joined the army the King had dispatched against Napoleon, Marie Therese remained at Bordeaux where, every day, she would speak to the soldiers, encouraging and praising them. She also examined the list of volunteers at the town’s hall daily, but when the people heard the King had fled the country after his army had joined the enemy, the numbers of men willing to fight lessened with each passing day. The Duchess was told by the King to flee too, but she refused. Napoleon now asked her to leave the country too under his protection. He knew he couldn’t hurt the “Orphan of the Temple” and this to him seemed the best solution for all. Marie Therese retaliated that she would never surrender. 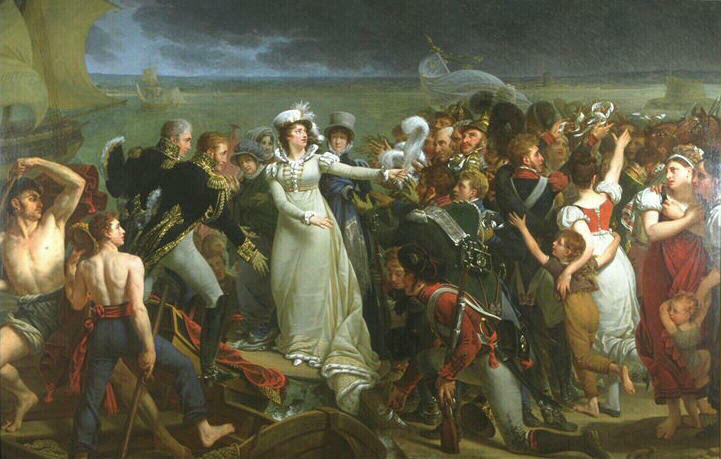 But when she realised that most of the men in her small army had no intention of fighting a civil war, she had no choice but to give up her effort and leave France. She had been the only member of her family who had tried till the end to put up a fight against Napoleon. This impressed the Emperor who proclaimed his admiration by saying of her: “She is the only man in the family!” Marie Therese went first to Spain and then to England, where she petitioned the Prince Regent for men and arms to fight Napoleon. Napoleon’s rule would be short-lived and soon the Bourbons would be restored again.